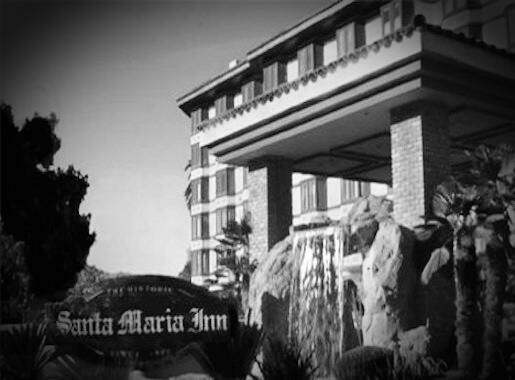 The Santa Maria Inn is reportedly home to many ghosts. One of which is a sea captain, who was first seen a few years after the hotel was built, back in 1917. He is believed to have been murdered by his mistress and is reported to haunt throughout the hotel. His apparition has been seen on many occasions, and he’s supposedly most attached to room 210. The ghost of legendary actor, Rudolph Valentino, is said to haunt the Santa Maria Inn also. He’s reportedly attached to room 221, where he likes to knock on the door, and has even been witnessed lying back on the bed in this room, with his indentation clearly seen on the top of the covers. The ghost of a woman known as Peppy has also been reported. She was apparently a cocaine addict, and was known as peppy due to her constant upbeat mood. Exactly who this young woman is isn’t known. Various other phenomena has also been reported inside the rooms, as well as the gardens, and the cellar. These include a piano that plays by itself, mysterious footprints, opening and closing of doors, sudden drops in temperature, disembodied footsteps, and poltergeist activity. Built in 1917 by Frank J. McCoy, as a humble hotel of 24 rooms, the Santa Maria Inn is a far cry from that now, boasting 164 rooms. The hotel was THE place to stay for people travelling along El Camino Real. Many famous guests have stayed here throughout the years including the likes of Charlie Chaplain, Rudolph Valentino, Bette Davis, Bing Crosby, and President Hoover. Located in the heart of Santa Maria, a city between San Francisco and Los Angeles, the Santa Maria has been a Central Coast landmark since 1917. The hotel boasts the comfort and style of the English countryside, together with the elegance of a bygone era. Ideally situated minutes away from the scenic central coast wine country, the inn serves up a charming blend of luxury, comfort, and impeccable service, together with the modern amenities that both business and leisure travelers expect. Award winning food from the Garden Room Restaurant is available, it offers dining in a comfortable yet elegant setting. The Santa Maria Inn is located in the heart of a beautiful landscape, offering plenty of outdoor pursuits. The foothills of the Sierra Madres are just minutes away, as well as pristine beaches, parks, mountains. world class hiking trails, and championship golf courses! There’s of course, the many vineyards that the area is renowned for. Shops, as well as bars and restaurants are also in abundance. For the latest rates and availability click here.